In this lesson we’re going to do some seriously cool stuff. We won’t be doing anything particularly new, but we will be giving a new perspective on an old idea. And in order to do so, we’ll need to incorporate and bring together ideas from several different lessons. In particular, we’ll be using the method of constructing a new function from two old ones that we learned about in the previous lesson to give a new perspective on the homomorphisms that we learned about in lesson 30. In that lesson (lesson 30) we saw that when we consider functions from groups to groups (as opposed to just from sets to sets), we’re able to single out certain functions as “special” in a very precise way. We decided to align with the entire mathematical community and call these functions homomorphisms, and the precise way in which these functions are special will be reviewed briefly below. Once this review is done, we will spend the rest of this lesson simply introducing a new type of notation—one that leaves out the gory details of what homomorphisms do to individual elements and instead emphasizes their abstract existence. The previous vague sentence will likely be a bit more clear by the end of this lesson. For now, let us continue with the review. Let’s let and be groups—any groups at all. Then, let’s let be a function from to , so that we write . There are many such functions, possibly infinitely many (if either (or both) of the groups have infinitely many elements). However, while there are many “just functions” from to , where we view and simply as sets, there are far fewer “special functions”, where by “special functions” we mean “homomorphisms from to ”. For a function to be a homomorphism, it must have the following property. It must be such that for any choice of elements , the element is the same as the element . We quickly take notice of the usual abuse of notation: the “dot” in the expression is the product in the group , whereas the “dot” in the expression is the product in the group . I.e., the abuse of notation comes from the fact that we’re using the same symbol to represent two very different objects (products in different groups), but nevertheless we carry on, trusting our ability to distinguish them whenever necessary by virtue of “well-defined-ness”. By this I mean that we need to trust our ability to see that the elements and are in , and so must be their product in , whereas the elements and are elements in , and so must be the product in . a function is a homomorphism . We recall that the “ ” symbol is simply shorthand notation for “if and only if”, and that the “ ” symbol is simply short hand for the words “for all”, so that the above statement reads in pure English as follows: the function from the group to the group is a homomorphism if and only if for any two elements in , the image (under the function ) of their product is equal to the product of their images. There are a few things to note about this whole setup, and they’ll all be important for what we’ll do in the rest of this lesson, and really for our entire futures as mathematicians/math lovers (not to be too melodramatic). First, the sentence that ended the previous paragraph is a hugely important one. Namely, we’ll constantly encounter statements about—or questions inquiring about—whether or not “the result of doing process A then process B is the same as the result of doing process B and then process A”. Here, the “processes” are a) group multiplication and b) using the function. So, what we’re saying here is that a homomorphism is a special type of function which has the distinct quality that “using group multiplication then using the function is precisely the same as using the function and then using group multiplication”. To be precise, by “using group multiplication” we mean “using the multiplication of the relevant group ( or , depending on which stage we’re at)” and by “using the function” we mean “sending the element(s) that we have over to the codomain using the function. Finally, by “…is precisely the same as…”, we mean that for any two elements that we start with, we’ll always end up at the same element in regardless of which path these two elements take (process A then B or process B then A (of course the element that we end up at in is dependent on which two elements in we choose initially, here we’re just saying it is independent of how we take their product over to )). The second thing to note about how our homomorphisms are defined is that their specialness is itself special! By this I mean that homomorphisms are special in such a way that they couldn’t be anything else. This may seem somewhat anticlimactic, but it’s actually quite significant. We won’t be able to see this fully just quite yet, though in the next couple lessons this will hopefully become more clear. However, to begin to see this, let’s try to imagine the following somewhat odd scenario. Suppose you’re a real estate agent and you’re sent to go to a house and write about the interesting things about it to hopefully convince others to come check it out. Now imagine that it’s not a house you’re meant to write about, but rather a mathematical structure (cheesy, I know, I’m sorry). Luckily for you, you’ve read up to lesson 32 of this site and so you know a couple of things about how math works, and you know how to ask some interesting questions about such structures. Suppose the structure that you’re sent to write about is the following structure: a function from a group to a group . And that’s it. You know nothing else about the structure. Suppose finally that your editor loves group theory and requires you to write something about groups. Thus, you can’t just avoid the topic of groups and write about whether or not or are infinite, or whether or not is a subset of , since none of these types of things take advantage of—in any way—the fact that we know that and are groups. With the limited—or rather completely general—knowledge that we have about the mathematical structure, and with the somewhat odd (but also completely reasonable, since why shouldn’t we take advantage of the knowledge we have?) requirements, we quickly find that asking whether or not the function obeys “combine then send = send then combine” is the only thing that we can do. Namely, group multiplication “combines” and a function “sends” so when all we have are two groups and a function, the above is the only question we can ask! What we’ll now do is see how to express this “naturalness” of homomorphisms, as well as the general equivalence of “send then combine equals combine then send”. To do this, let’s first recall from lesson 22, where we first introduced groups, that group multiplication is really a function from (which then satisfies certain requirements, like associativity, etc.). Thus we write, being careful to take note of all of the dots, the following expression: “ ” where “ ” takes an element and sends it to the element which we call the “product of and ”. The exact same story holds for the group , since after all both and are just arbitrary groups. The final ingredient we’ll need when introducing this new, abstract notation for a homomorphism is the notion of the “product” of two functions that we learned about in the previous lesson. Let us briefly review what we did there. We suppose we’re given two functions and . We can then define a function from to as follows. Any element in is of the form with and . Thus, we can consider the element and the element . Indeed, we can put these latter two elements together to form the pair , which is indeed an element in , since the first slot is an element of and the second slot is an element of . So, what we have now is a rule which assigns every element to some single element in , and this is precisely the definition of a function! Thus, we define the function from to as that which sends every to , and we denote this function (for obvious reasons) by . Thus, purely in symbols we have . If the reader is at all shaky with this notion of a “product of functions”, I strongly encourage him/her to revisit the previous lesson as this construction is very important for what is to follow. We’re now as ready as we’ll ever be to introduce the new symbolic expression of “homomorphism-ness”, however it will likely not be completely transparent immediately, so I’ll follow it up with (hopefully) sufficient explanation. Here we go. We say that the function is a homomorphism if and only if the diagram in figure 1 commutes (don’t worry, we’ll spend almost the entirety of the rest of this lesson explaining what “commutes” means). Now, don’t worry if figure 1 is not at all clear right now. I’ll begin the explanatory process by saying that this diagram is nothing but a diagram of functions. The corners denote the sets that are involved, and the symbols above/next to the arrows are the names of the functions whose domains are at the back of the arrow and whose codomains are at the head of the arrow. We note that the two dots in figure 1—the one above the top arrow going from left to right and the one above the bottom arrow going from left to right—are not accidental. In fact, these dots are there precisely because we view group multiplication as a function from the Cartesian product of the group with itself, to the group. This was summarized above in this lesson. Thus, the figure is indeed correct in the sense that the “labels” on each arrow are indeed labels of functions. In particular, the label on the left-most arrow going from top to bottom is , which is the “product function” we defined in the previous lesson. 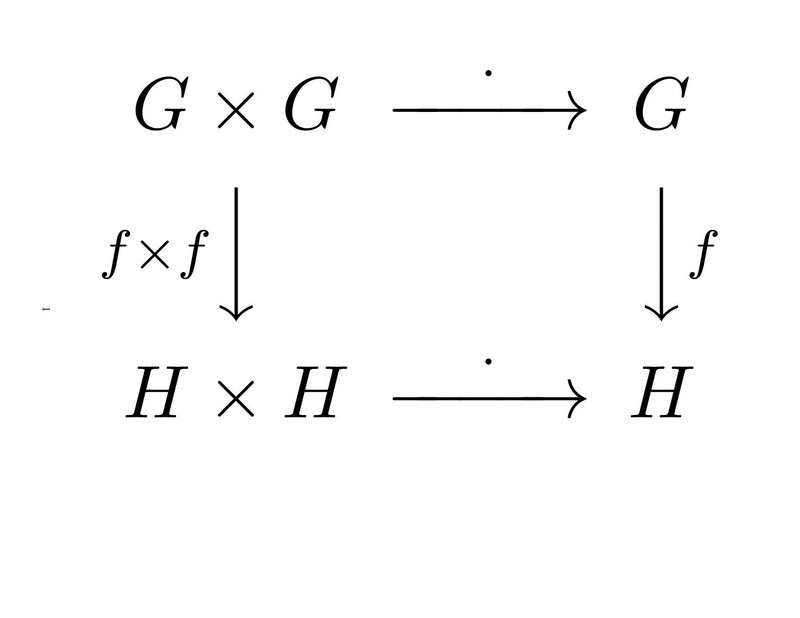 Additionally, the arrow on the right from top to bottom is labeled by which is precisely the function from to that we are inquiring about (i.e., whether or not it is a homomorphism). As mentioned, the two arrows going from left to right in figure 1 are labeled by “ ” as these are the group multiplications in the groups and , respectively. We note that we are again using the exact same abuse of notation that we have used many times before. Namely, we are using the same “ ” to denote two possibly completely different mathematical structures. This was also already summarized above in this lesson, and we simply reinforce that this is bad practice only if we’re not careful to remember that we’re using this bad practice. We say that figure 1 “commutes” if it is true that “it doesn’t matter which way we go through the diagram”. Now, we must make sense of what we mean by this statement. First, by “go through the diagram”, we mean the only thing that we can mean. Since all arrows go from left to right or from top to bottom, we must in some sense be asking if it is the same to start at the top left (at ), go to the right over to (using the relevant function, i.e., that function which labels the arrow from left to right on the top), and then down to , as it is to start at the top left (again at ) and go down to using , and then over to . Note that in both cases we’re starting and ending at the same place, but using two different routes. We want to know if, by starting at the same point, we end up at the same point regardless of the route we choose. But to answer this question we must again ask what we really mean. Namely, what are we really saying when we say things like “start at ”? After all, these are statements that we have not yet clearly defined. Luckily, it again turns out that it is quite literally the only thing that we can possibly mean that ends up being the thing that we mean (this is not a typo). In particular, if we think about what we might mean by this statement, we end up seeing that we must be starting with some particular element in . After all, the only things that we have in play are sets (which have elements) and functions (which map elements in one set to elements in another set). So the question really is the following: If we start with any arbitrary element in and use the two different routes through the figure (across then down, or down then across), will we always end up at the same element in ? If the answer to this question is yes, then the function is, by definition, a homomorphism. Let us see what this means in practice, i.e., let us take an “explicit” element in and see where it lands in in each route. I use scare quotes around the word “explicit” in the previous sentence because what we are about to do is hardly explicit. This is because I will be choosing an arbitrary element from the set , where is an arbitrary group. The only thing explicit about this whole discussion is that once we do choose some arbitrary element in , then we will explicitly see where that element goes in . The word “explicit” has many different meanings in math depending on the context in which we use it and I’ll do my best to be as explicit as possible about how we’re using the word “explicit”. Okay, enough talk, let’s do some math. Let us choose an element (any element) from . How do we do this? Well, we know that any element at all in can be written as , where both and are elements of the group . So let’s consider the (arbitrary) element . Suppose we first go across the top of figure 1, namely suppose we apply group multiplication to to get the element . We’re now at the top right corner of figure 1 and we need to go down to using the function , so we land at the element . Now suppose that we again start with the element but now suppose that we first go down in figure 1, using the function . This lands us, by definition and by recalling the previous lesson, at the element . We now use the group multiplication in , which corresponds to going from the bottom left corner of figure 1 to the bottom right corner of figure 1, and which sends the element to the element . The previous two paragraphs have therefore shown that by starting with element at the upper right corner of figure 1 and taking the path along the top and then down the right, we land at , whereas by taking the path down the left and then across the bottom we arrive at the element . Thus, the statement that “these two procedures are always the same as each other, no matter which element we start with”, is precisely the statement that “for any (or equivalently, for any ), we have that ”. We recall from lesson 30 that this is nothing but saying that is a homomorphism! Let us make this all precise by making the following definition. Definition 33.1 We say that a diagram such as that in figure 1 commutes if the process of starting at the top-left and moving to the bottom-right is independent of the path we choose, as described in the previous paragraphs. Definition 33.2 An equivalent way of saying that a function between groups is a homomorphism is by saying that the diagram corresponding to figure 1—which we can always construct given the groups and and the function —commutes. In this way we have, in figure 1, encapsulated a certain part of the abstract “essence” of homomorphisms by focusing not on what they do to individual elements (though this is of course floating around in the background of our definition of what it means for figure 1 to commute) but rather on how a homomorphism relates two groups. Namely, figure 1 quickly and beautifully encapsulates the basic features of a homomorphism, which is that it doesn’t matter (for a homomorphism) whether we “combine and then send” or if we “send and then combine”. Quite often in mathematics it is useful to strip away all unnecessary ideas in our notation, and the notation in figure 1 is one example of this process which will indeed come back into play far into the future for us. This lesson is already hugely long so we’ll leave further discussion for future lessons so as not to overwhelm the reader. However, I do want the reader to take a moment and look back at figure 1 one more time and simply appreciate it’s simplicity and beauty. Figure 1 is a very abstract diagram, encoding lots of abstract mathematical information—information that the reader likely was unfamiliar with before the previous few lessons. I would therefore ask the reader to take this moment to congratulate him/herself on the progress s/he has made in advancing this far through an abstract and wonderful world of mathematics that s/he might have never known existed. Once the reader is done congratulating him/herself, I would encourage him/her to go on to the next lesson and keep going! Are you still making these lessons?